Makin' it in Memphis: More details. The problem with it taking forever to get your tax return and then it taking forever to be your turn for the contractor (he's a busy guy) is that you get to think and think and think. I swear I've never planned so much for one thing in my life! 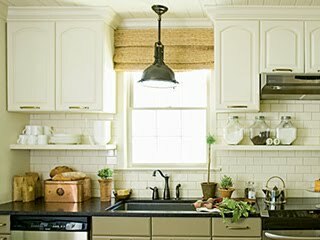 Well, I have decided I do want white subway tile as a backsplash in the kitchen. And Jake and I visited our appliances at Sears today (still trying to decide whether to buy in store or online through US Appliances...). I'm painting the cabinets white, will have black matte granite or solid surface counters, cork floors, black canvas pendant lighting... I know all this. I love this picture. And now it has me thinking - I was going to do dark pulls, in a matte black, but I'm wondering if I should do brushed nickel? It is a zoom out of the above picture. And it got me thinking because I have been debating about a color for the kitchen. Our den is (and will even more so) open to the kitchen and we really need to continue the green (Koi Pond by Sherwin Williams) into the kitchen. I just didn't want to go as dark in the kitchen... and the color I had picked out (Lemon Verbena) is more olive like I want, but just as dark. So now, with this picture above, I'm thinking I need to move lighter on the color wheel so I'm going to see what lies around Koi Pond that is lighter and more olive because I'm really digging this color from the Southern Living spread. OH MY GOSH---I LOVE IT!!!! Great photo inspirations! Reflecting back...I remembered this photo and it surely does look like your new kitchen! Funny - I just posted this picture in my post for tomorrow about paint colors... I referenced it as my "original inspiration".